Because the veneer on commercial grade plywood is pretty thin, I tend to be extra careful with glue around it. I don’t want to have to do any sanding because glue made its way onto the thin veneer. 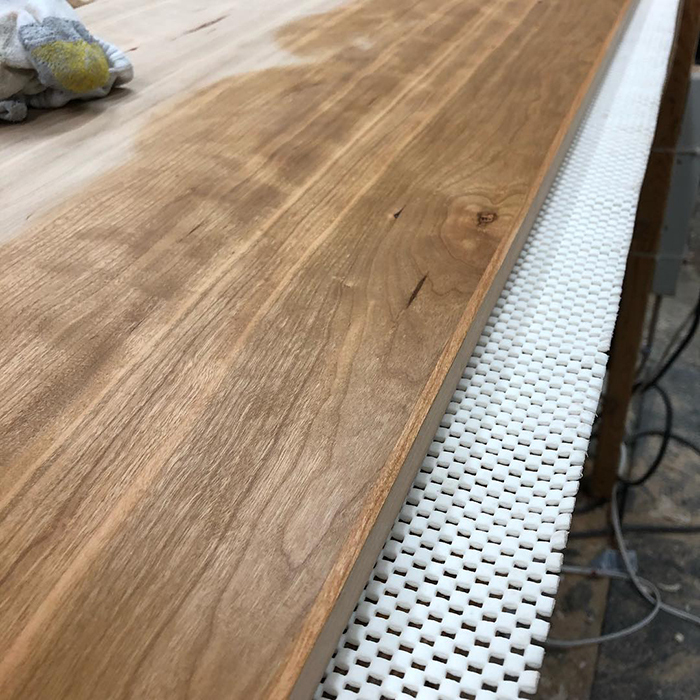 When edge banding strips of solid wood onto the edge of plywood it’s almost impossible to not get glue onto the veneer surface. One way to deal with this problem is to quickly wipe away the glue squeeze-out with a damp rag and another is to prevent the glue from sticking and deal with it after it dries; I prefer the latter. Several years ago (~2008) I bought a can of Waxilit, which is a very soft wax. Applying the wax to the surface of wood prevents glue from sticking and after the glue has dried onto the wax surface it is easily scraped away with your fingernail or a piece of plastic. After all of the glue is scraped away, the wax can be removed by wiping the area with a rag dampened with mineral spirits. A while back I ran out of Waxilit and recently I decided to try ordinary paste wax (I use Johnson’s paste wax) and the results were the same as with Waxilit. 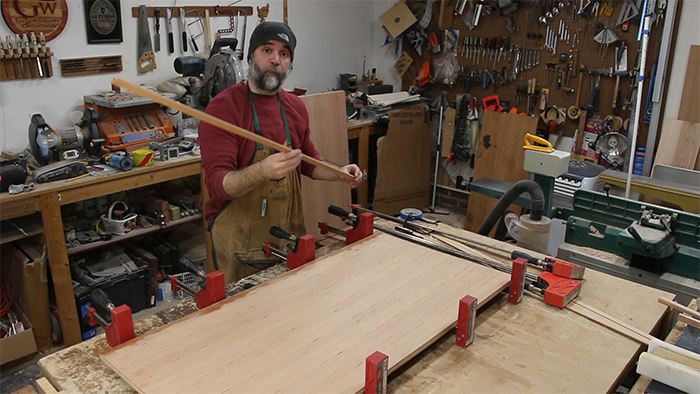 I apply the paste wax near the edge of the plywood where I will be gluing on the edge banding. After scraping away any dried glue, the paste wax is easily removed with a rag dampened with mineral spirits. And if you are using a wipe on oil-based finish, any residual wax that is not removed will dissolve into the finish as it’s applied. This is because wax, mineral spirits, and oil-based finishes are all nonpolar or lipophilic (lipid-like or literally oil loving) substances and if you remember from your high school chemistry class, ‘like dissolves like’. This means that nonpolar substances, like mineral spirits and oil-based finishes, will dissolve other nonpolar materials. Give this technique a try on scrap wood and see if you’re happy with the results; I think you will be. Last Friday, I published a video describing how to make and use a dial indicator jig to align your table saw blade to 45 degrees. The jig is incredibly easy to make, and if you made my 90 degree alignment jig, you might be able to use the same jig for 45 degrees as well. “We only need to align our tools to the accuracy that is required for the project we’re working on!”. The first two arguments are meant to imply that I am using dial indicators to align my tools because I want to be able to machine wood to within a thousandths of an inch, which is fallacious. I cannot stress enough that it is NOT my goal to use dial indicators so that I can machine wood to within a thousandths of an inch, but rather to use them so that I can align my tools quickly without making test cuts. The high degree of accuracy that comes along with using dial indicators is just a side effect; it comes along for the ride as a freebie. The third argument above I sort of agree with, but if you are going to align your table saw blade to 90 degrees why not align it to a degree of accuracy that would accommodate ALL of your projects (you might forget to re-align it)? My point above regarding speed applies here nicely; that is, if it’s just as fast or slower to align your table saw blade with a lesser degree of accuracy (by using a square against the blade) then you’d be sacrificing accuracy for no logical reason. 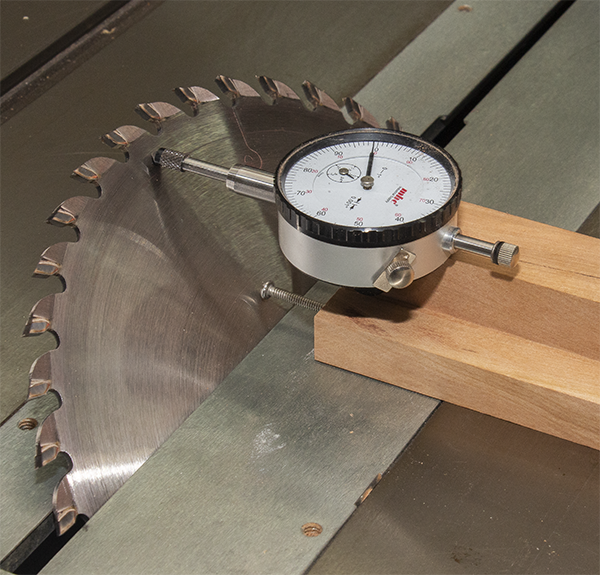 I think you’ll find that pushing a dial indicator jig against your blade (after it’s calibrated – which is a quick process), is just as fast as pushing a square against your blade. The difference is that the dial indicator jig will offer you greater accuracy. I recently had the idea of trying to make a toggle clamp more versatile in the wodshop. What I came up with was a sliding dovetail attachment that can be used with your existing toggle clamps. So far I am pleased with how well they work in the shop. 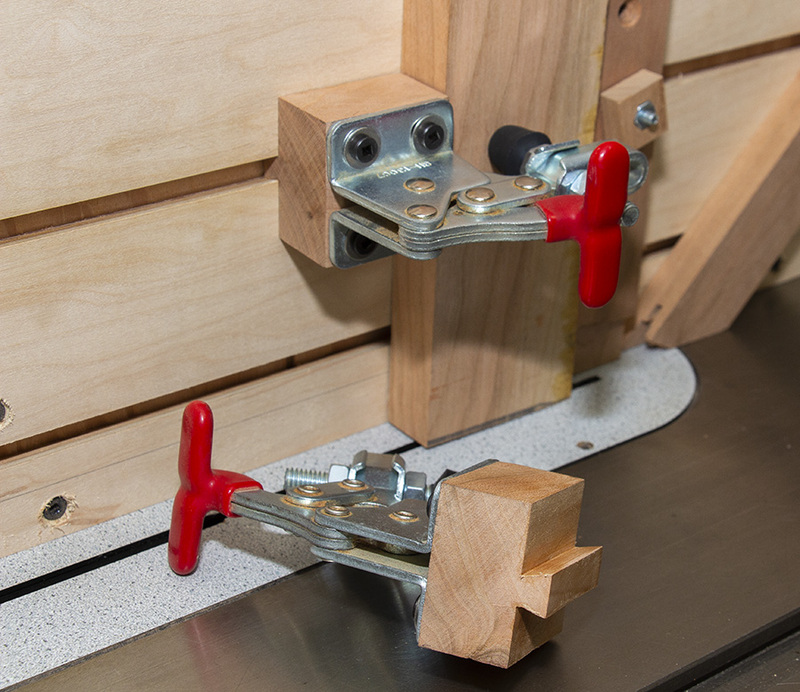 With the add-on, you can quickly move your toggle clamps from jig to jig without having to use screws to attach them. The build video can be viewed here. In the video I wasn’t very clear regarding the sizing of the male dovetail. When sizing the dovetail it would be easier to remove some (~1/2” or so) of the side supports so that you can test fit the male dovetail in the dovetail channel. And if it’s too snug adjust the router fence accordingly and remove more of the sidewalls of the dovetail (male). Also, when making the dovetail (male), the height of the bit will determine if it contacts the bottom of the dovetailed channel; this is easier to get right then the side to side fit of the dovetail (the bit should be slightly lower than what is used to make the dovetail channel). After the dovetail fits nicely with a test fit, the remaining side supports can be removed. If you make these and find them useful, please let me know. Also ask me any questions if anything isn’t clear.